The article below was written by Kitt Doucette, a writer for Men’s Journal. Kitt was part of our Discover Boating flotilla who chartered with us back in August. 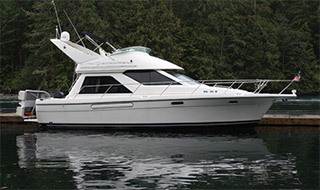 The best place to begin your week around and on the Juan de Fuca Strait is in the funky town of Anacortes, home to Anacortes Yacht Charters, where you can rent a variety of different vessels, ranging from powerboats to skiffs. If need be, less experienced sailors can also find a local captain. A skipper’s knowledge of the area can go a long way toward ensuring that visitors get the most out their time on the water and remove a lot of the stress. 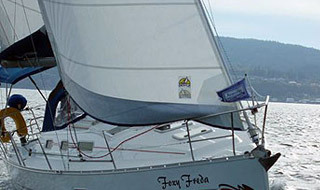 If you want to man the helm, AYC requires that you pass a three-to-four day course – fun but time consuming. From Anacortes, head toward Fisherman Bay, a quiet inlet on Lopez Island that served as a hub for the San Juan’s early settlers. Be sure to drop some crab pots at the mouth of the bay before going ashore for dinner at The Bay Café. If salmon is on the menu – and it usually is – you’d be foolish to order something else. After picking up the crab pots the following morning, dump your new Dungeness friends in the cooler for later. Lopez island is a great place to go kayaking and the Outdoor Adventures Center onshore offers tours that give paddlers a chance to get friendly with harbor seals while learning about a few of the eccentric characters that settled the islands. A few hours from Fisherman Bay is Reid Harbor, a narrow finger of water sheltered on three sides near Stuart Island. Reid Harbor is a great place to anchor for the night and boil the crabs you caught earlier that morning. 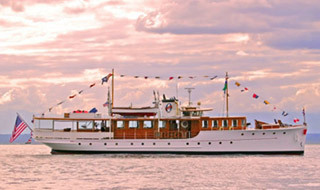 From Reid Harbor, it’s an hour’s cruise to Roche Harbor and the great marina there. Sip a few “Army Pops,” a local euphemism for bottles of beer, and watch boats of all shapes and sizes pass by before heading to Madrona Bar and Grill, a local institution that doesn’t take reservations. The fishing at the mouth of Open Bay near Roche Harbor is fantastic, unless the pod of resident orcas decides to show up and scare the fish away, in which case it is a great place for whale watching. Finish your trip in Friday Harbor, the largest town in the islands and the only one with a reputation as a good place to get loose. A seaplane operated daily by Kenmore Air is a quick (and scenic) way to get back to Seattle. The flight offers views of the islands in every direction. The view is bittersweet. There are too many to visit on one trip. More information: The drive to Friday Harbor, including the pleasant ferry passage from Ship Harbor outside Anacortes, only takes about three hours, making these some of the more accessible islands around. 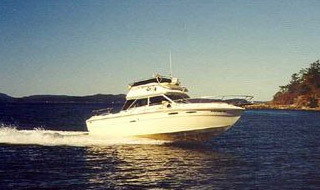 For more information, visit Discover Boating’s San Juans information page.